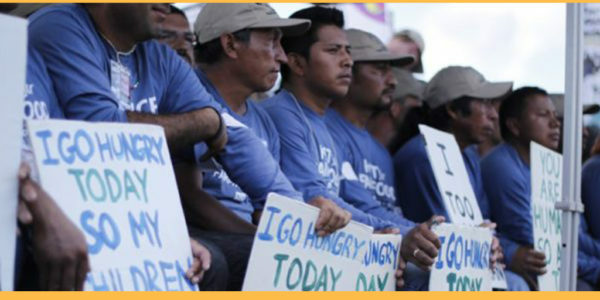 The Coalition of Immokalee Workers is a worker-based organization recognized for its achievements in corporate social responsibility, community organizing, and modern-day slavery. The Equitable Food Initiative is a program that brings together growers, farmworkers, retailers and consumers to transform agriculture and improve the lives of farmworkers. FLOC is significant to the farm worker movement for creating and popularizing the corporate campaign and as the first union to represent H2A guestworkers. Familias Unidas por la Justicia is an independent farm worker union of indigenous families representing over 500 Triqui, Mixteco, and Spanish speaking workers. The Farmworker Association of Florida does community organizing, education, and advocacy, to build power among farm worker and rural low-income communities. PCUN is Oregon’s farm workers union and largest Latino organization in the state. It’s goal is to empower farmworkers to take action against systematic exploitation. The United Farm Workers of America is the nation’s first enduring and largest farm workers union. Support the campaigns led by our partners!